The first ½ oz. silver coin in the Royal Canadian Mint’s 2013 O Canada series focusing on iconic Canadian images, this beautiful coin celebrates the national Inushuk stone monuments/scuptures. An excellent addition to your nature-focused, Northern or Canadiana coin display. 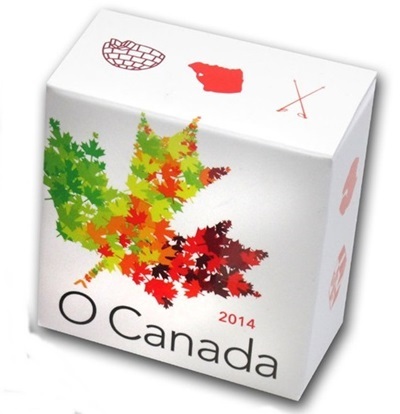 • The coin is the first coin in the O Canada 1/2 oz silver coin series. • This design has incorporated each of the various finishing details available to the Mint to ensure a detailed execution of the final product. This coin will have you looking at it over and over to see all the fine details. • Engraved in exquisite detail to celebrate one of Canada’s most popular national sports. • A great gift and collectible the series will celebrate the Canadian culture, hockey and sport in Canada, Canadian history, and the country’s unique iconography. • Struck in 99.99% fine silver. coin was designed by Canadian artist Tony Bianco and features a human-shaped Inukshuk standing before the icy mountains, frozen sea and aurora borealis characteristic of the Canadian Arctic. An inukshuk (pronounced "inook-shook") is a sculpture of piled stone used as a place marker, navigational aid and communication tool. Packaging Your coin is encapsulated and presented in a maroon clamshell case lined with flock and protected by a customized full color sleeve.